Impact Boom has welcomed an amazing group of 25 passionate social entrepreneurs into the Elevate+ Accelerator Program in Brisbane. 14 high potential, emerging social enterprises are tackling an array of pressing community issues both locally and internationally, such as homelessness, refugee and migrant support, sustainable consumption, waste reduction, child malnutrition, and health problems. Projects are creating positive social and environmental impact and literally saving lives. We'd like to thank Brisbane City Council for proudly supporting Elevate+, as well as the entire cohort for the hard work and grit they have demonstrated in getting to where they are. Bertonni’s mission is to create meaningful employment opportunities and pathways out of disadvantage for people experiencing homelessness, through the design and manufacture of high-end porcelain homewares and lighting. There is currently a lack of employment options for people living in disadvantage; at the same time, consumers increasingly desire products that are not only beautiful and functional, but also imbued with narrative and an imperative to create social change. Bertonni aims to fulfil the needs of this consumer market, whilst becoming a global leader in the training and employment of people experiencing homelessness. Like a book library, but for hand tools, power tools, camping and sport equipment. Giving access to tools, while reducing consumption and waste going to landfill. Thanks to a flexible membership scheme our users can borrow any of the items that we have in our inventory. You can borrow them by either walking into our tool library or pre-booking them online. The main goal is to go beyond the material consumption of the current “take, make and dispose” system. Recycling, re-using and re-purposing is possible, a circular economy means that products no longer have a life cycle with a beginning, middle, and end. The new products’ life will be “from start to start”. Brisbane Tool Library is building a fundamentally different way of thinking, showing that some goods that people perceive as waste, can be a resource for other people or projects. We’re creating a real sharing and circular economy, because we’re richer when we share. While creating a strong community around us, we provide access, maintenance, and storage of the items, allowing people to save money on products and services that might otherwise have been un- or under-used. Team - Sabrina Chakori and Anna Schneider. Chatloop connects refugees and volunteers via a messaging app, so refugees can get authentic and convenient practice communicating in the language they are learning. 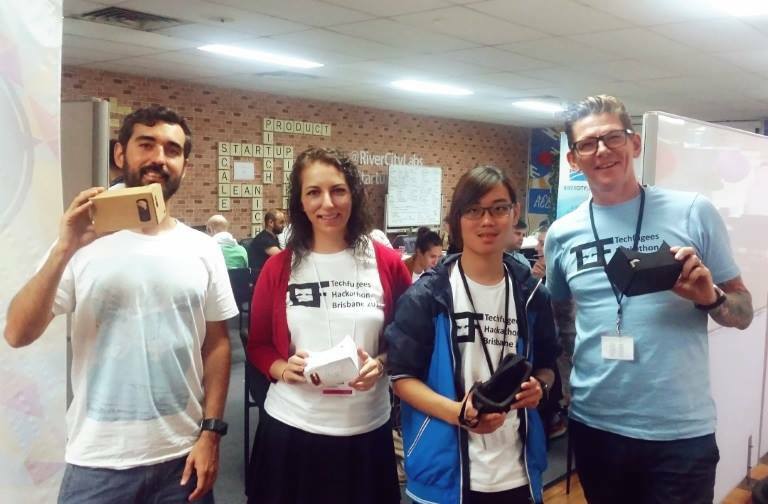 For the volunteers, ChatLoop micro-volunteering enables them to make a real impact, without it impacting their schedule or wallet. Ethni is a social enterprise enriching lives in the space where culture and creativity meet. They offer a range of unique creative experiences facilitated by young women from culturally diverse backgrounds, who draw on their own cultural knowledge and creative talents to provide fun and engaging activities for all ages. Through the experiences offered, they aim to achieve their purpose of sharing and celebrating the vibrant cultures that call Australia home, while providing supported and meaningful employment opportunities for young women from culturally diverse backgrounds. Five Mile Radius is an Australian Design Studio building with locally sourced materials. Five Mile Radius consult with clients and design projects that use site specific materials, involve local people and their culture and respond to the local climate. Their public engagement division is developing an exciting range of digital and physical means for sharing their processes with the world. They create content, networks and tools aimed at inspiring and helping people to go local themselves. Act local, think global. Visual Spatial Neglect (VSN) is a pervasive condition afflicting many brain injury patients (in particular post stroke patients), and the condition effectively removes a patient's ability to see one side of the world. Many sufferers aren't aware that they have the condition (this is referred to as anosognosia) and so, coupled with common physical aspects of brain injury such as mobility and balance difficulties, it can progress to become a very dangerous affliction. Currently, there is no at-home therapy solution to treat visual spatial neglect, meaning that patients have to rely on relatively expensive dedicated therapy. Hemia Optics have designed a system to help treat VSN within a patient's home to increase functional outcomes for sufferers and to allow a greater degree of independent living. Lána is an ethical, maternity fashion label with items available for purchase or rent. We’re removing the barriers to affordable and stylish maternity fashion. Lána the Label is designed and made in Brisbane, Australia. Connected to the label, Lána has an online marketplace for stylish mothers to share their clothes. We call it the Lána Loop. It’s a platform where women can resell or rent-out their pre-loved maternity clothes. Good for the wallet, great for the planet. Our mission is to empower women as they journey into motherhood by providing access to stylish, affordable and sustainable maternity fashion. Mammojo seeks to address the global disparity in maternal and infant health issues through the sale of high-quality, innovative, breastfeeding friendly activewear, or Lactivewear®, if you will. They believe in removing the barriers that allow people to live life to the full. They also believe that by creating quality products to address first world problems, they can use proceeds from the sale of these products to make a positive contribution to the world, whether it be donating to life-saving research, care and equipment for premature babies or by helping to reduce the shocking mortality rate during pregnancy and childbirth for mothers and their babies in developing countries. Co-Founders - Melita Shirley and Jonathan Shirley. MyMedHealth technology (by UpRize) creates distinct value for the patient and the health service through the development of a tracking app for patients for the early detection of sepsis. Sepsis is a life-threatening condition caused by the body’s response to infection. Across Australia, this preventable condition affects 18000 people annually, of which approximately 5000 will die and over half will be left with a disability. It is a huge burden on the Australian health system, costing an estimated $846 million to treat in Intensive Care Units annually. The UpRize team recognise the financial burden of sepsis, the increased pressure on hospital beds, and the social impacts for those that survive sepsis. Through extensive consultation and collaboration, we have identified a solution that will support the early detection of sepsis to ensure that people at risk can seek lifesaving hospital treatment in a timely way for the best outcome. The MyMedHealth technology is an app on a smart device that tracks patient vital signs of blood pressure, respiratory rate, pulse and temperature. The app will have inbuilt the sepsis alert as determined by the Australian Sepsis Network. This app will interface with carer’s phones and potentially clinician’s software when vital signs indicate sepsis. This will flag patients with sepsis, enabling them to access the closest emergency department for treatment, saving lives, reducing the burden on the health care system, and improving the social impacts. The MyMedHealth solution allows for the right care to be provided at the right time. For the health service, this would have significant financial and practical advantages and will align with strategic drivers. For patients this technology offers piece of mind that has not previously been available. THE DREAM OF TWO SISTERS, THE SOCIAL GOOD OUTPOST (SGO) IS PIONEERING HOW TO USE DESIGN TO DO GOOD IN THE WORLD. The Social Good Outpost (SGO) creates good designs for good causes. Combining graphic designers and community leaders under the one roof, SGO works with non-profits, social enterprises, and businesses to create logos and branding, websites, infographics and marketing materials, and all other designs. Operating on a sliding scale model of business, SGO offers clients accessible leading edge design, with each full cost service going towards supporting pro bono and low cost design for community organisations who otherwise can’t afford it. SGO helps community organisations to establish credibility, communicate impact and gain sales or funding. SGO also helps businesses to increase their social responsibility. SGO is driven to be the go-to designer for increasing your social impact within Australia and the world. Sound Off for Schools is a 'silent revolution' to bring Mindfulness Education to schools in Brisbane. 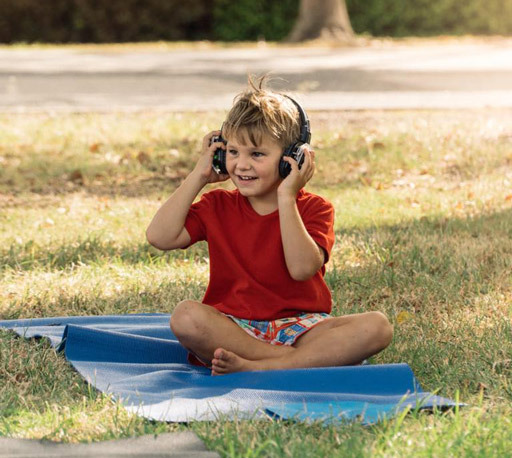 Their technology allows students to wear wireless headphones to hear the low ambient music and teacher instructions to learn the skill of being present and to be guided through meditation and movement of the body connected to the breath. The program is designed to allow students an opportunity to 'tune in' to their own breath, thoughts and movement of the physical body to begin learning the skill of being present and mindful. The headphones are noise-cancelling and provide a very intimate and personal experience for the participant to learn mindfulness skills and strategies (without the distraction of their peers!). The content of the program can be designed for each specific context and predominately focusses on; Matters of the Mind - resilience, regulation of emotions and awareness of thoughts and; Conscious Curriculum - enhancing learning, focus in the classroom and meta-cognition. All programs are based in Yogic philosophy and grounded in the physical movement of the Yoga Asanas. The Unknown Project is a Brisbane based social enterprise promoting access to education and opportunities for young people from refugee and asylum seeker backgrounds in the community. The Unknown Project leave clues on wrapped books as a 'don't judge a book by its cover' model, serving as a metaphor for the treatment and rhetoric surrounding refugees and asylum seekers in Australia. With their proceeds, they supply school resources to The Romero Centre (a refugee support centre in Dutton Park). In 2018 they will move more into community engagement through events. Welcome 360 is a 360 video film service and elearning platform which helps refugees and new migrants with daily life challenges, such as using banks, libraries, or shopping centres. Our research suggests that migrants can often only develop life skills and confidence by repeating training scenarios. By providing immersive training videos online, clients can use Welcome 360 content whenever and wherever they need, addressing accessibility and demand issues. We work with language services, government, businesses, healthcare and community organisations to help people integrate into new ways of life. Co-Founders - Amanda Alexander, Jogen Phang, Steve Williams. YAKU LATIN GOODS IS A BRISBANE-BASED SOCIAL ENTERPRISE THAT SUPPORTS SOCIAL PROJECTS FROM A GLOBAL COMMUNITY PERSPECTIVE, THROUGH TRADING ETHICAL GOODS FROM LATIN AMERICA. Through their Yaku Model, they import organic, fair trade and socially responsible goods from Latin America; trade at organic markets and festivals in Brisbane and online; and support health and education projects. Since 2016, Yaku Latin Goods has been importing and trading organic dark chocolate from Ecuador, and a percentage of their profits goes to supporting two social projects: one in Peru which assists children with chronic malnutrition, and one in Myanmar that provides shelter and education to young orphan girls. As they expand their business, they will maximise their support to foster healthier communities in Australia and overseas. Elevate+ is proudly supported by Brisbane City Council & Seven Positive. Find articles To help you on your social entrepreneurship journey.